"Dear Mark, You will forever be in our Prayers, Thoughts, and ♥️ Hearts. May you Rest In Peace. We Love you 🙏❤️"
Mark W. Srnka, 59, of Kirksville, Missouri, passed away unexpectedly on Wednesday February 28, 2018 at the University of Missouri in Columbia. He is preceded in death by his grandparents and father Al Srnka. He is survived by his mother, Elizabeth “Liz” Srnka of Kirksville, Mo; one brother, Scott and wife Maria; two nieces, Sydney and Avery Srnka of Plainfield, IN. Mark enjoyed a full and happy life. He was an extremely loyal friend. He was dedicated to his family, faithful companion Moe and his many friends. In Mark’s younger years he enjoyed spending time with his grandparents on their farm in Novinger. Mark soon learned to “live life at full throttle” while he travelled with his friend Sonny Findling racing late model stock cars. Mark was known in the pit crew as the 9/16 wrench and grease rag guy. Racing was not his only passion, Mark enjoyed playing golf, and the many trips he took to Alabama and Arizona to play golf. Mark was also an active member of the Kirksville Country Club. In the off months of racing and golf, Mark loved to hang out at Woody’s with his friends and was a huge Kansas City Chiefs fan. He enjoyed working and doing various types of construction. 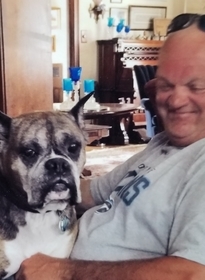 Mark also enjoyed spending time with his faithful companion Moe and taking him for drives around town. A Memorial service to celebrate Mark’s life will be held at Trinity Episcopal Church in Kirksville on Saturday, March 24th at 3:00pm.